A bibliographical magazine published by M. Steinschneider, twenty-one volumes of which, covering the years 1858-82, were issued. Its full title reads: " : Hebräische Bibliographie: Blätter für Neuere und Aeltere Literatur des Judenthums." It is an invaluable aid to the student of Jewish literature and history, as it contains, besides bibliographical information of the most varied sort, many independent essays and researches by Steinschneider himself and by the leading Jewish scholars of the period. 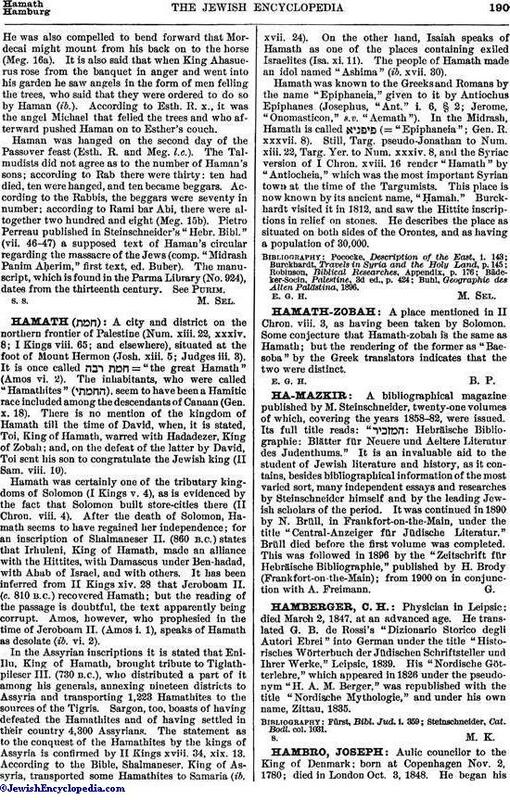 It was continued in 1890 by N. Brüll, in Frankfort-on-the-Main, under the title "Central-Anzeiger für Jüdische Literatur." Brüll died before the first volume was completed. This was followed in 1896 by the "Zeitschrift für Hebräische Bibliographie," published by H. Brody (Frankfort-on-the-Main); from 1900 on in conjunction with A. Freimann.